George Friedrich Handel, a renowned German-English composer originally created "Messiah" as an 'Easter' offering. Handel's famous oratorio, 'Messiah' received tremendous attention prior to its first performance day, and was much awaited. He developed a unique mode of composition, ORATORIO, i.e. Choral dramas that emphasize arias and recitations. His use of choruses and spiritual sentiment in these pieces evolved into a new form of musical entertainment. Handel was a unique musician who in addition to operas and oratorios wrote anthems and chamber music. Handels 'Messiah' has been described by the early music scholar Richard Luckett as " a commentary on Nativity, Passion, Resurrection and Ascension", beginning with God's promises spoken by the prophets and ending with Christ's glorification in heaven. Handel became blind towards the later part of his life, but despite the blindness, he continued to perform and conduct concerts. He was an inspiration to other composers and musicians, and died shortly after conducting a successful performance of "Messiah". Beethoven revered Handel's strength and creativity and wrote in 1824, "Handel is the greatest composer who ever lived. I would bare my head and kneel at his grave". Few pieces can deliver a fresh perspective each time they are heard. Handel's 'Messiah' is one of those works that yields a new secret on every hearing. For modern listeners, it holds a place of reverence in the canon for its universal appeal and moments of timeless expression. The first performance of "Messiah" was in April 13, 1742 by George Friedrich Handel for a Charitable Musical Society in response to the great famine. At its debut, Messiah was entitled 'A Sacred Oratorio' and all its proceeds were donated to local charities and hospitals to support the people affected by the greatest famine. Almost 72 years on "The Oratorio" conducted by St. Thomas MTC Choir is presented for a special cause i.e raise funds for the Our Lady of Arabia Cathedral – Bahrain. 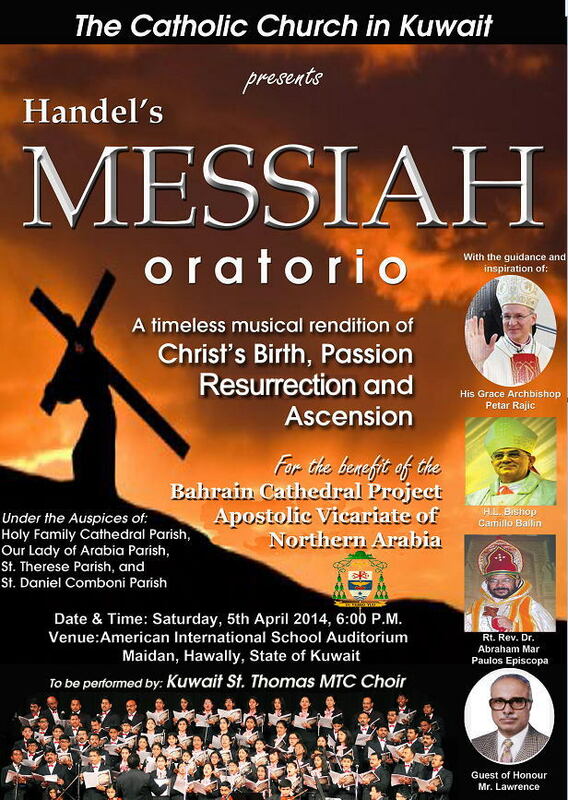 The Oratorio will be presented in Kuwait at the AMERICAN INTERNATIONAL SCHOOL auditorium on April 5, 2014 @ 6:00 p. m SHARP. Despite being a charity event, the entry passes are reasonably priced so as to afford everyone a chance of a lifetime. During this Lenten Season this musical offering is a unique concert for all music lovers irrespective of age and will surely etch a splendid and irreversible memory in the minds of the audience.